LOS ANGELES (Reuters) – The smell of rotting food and decay inside 10956 South Wilmington Avenue, Los Angeles, was overwhelming. A burst pipe in the kitchen ceiling leaked water onto a floor littered with half empty cans, razor blades, odd shoes, stained clothing and an upturned, mold-ridden sofa. Windows were smashed and boarded up. The vacant home was foreclosed on in August 2011 by Bank of America, which has done nothing to repair it. And in a cruel twist that underscores the connection between the housing meltdown and the fiscal crisis afflicting many local governments, the city of Los Angeles lacks the wherewithal to force the property owner to clean up the mess. Across America, bank-owned, blighted houses sit untouched, sometimes for years, disfiguring what in many cases are already troubled neighborhoods. Activists say the problem is particularly acute in minority areas. And many cities do not have the resources, the will or the power to force banks to maintain their properties. The house on South Wilmington Avenue and the heavily African-American south Los Angeles neighborhood where it is located offer a case in point. Of roughly 400 bank-owned homes surveyed in the area, half are in a state of blight, with a third “seriously blighted,” according to two activist groups, Good Jobs LA and the Alliance of Californians for Community Empowerment. Yet even though the city of Los Angeles, with some fanfare, passed an ordinance two years ago compelling banks to repair blighted homes they own, or face fines, not a cent in penalties has been collected. “My people don’t even have time to go to the toilet anymore,” said Luke Zamperini, head of the Los Angeles Building and Safety department, which is responsible for enforcing building codes and collecting fines. Zamperini said his department had been cut by 60 percent over the last five years as a result of a non-stop state and local budget crisis. He now has a code enforcement team of just five people responsible for the entire city of Los Angeles, which has a population of nearly four million. The tiny group deals with everything from vacant buildings to outdoor advertisements to land-use issues. In a statement, Bank of America apologized for the deteriorating condition of 10956 Wilmington Avenue. “When a vendor was sent to secure the property following the foreclosure, he was met by a man with a pit bull and was not able to complete the work,” the bank said. If it is a lack of resources that is part of the problem in Los Angeles, across the country in New Jersey it may be partly a lack of legislation. Three cities in New Jersey – Newark, Camden and Edison – rank in the top 60 U.S. municipalities for foreclosures, as measured by the percentage of homes in foreclosure, according to the office of state Senator Ronald Rice. He has introduced a bill that would empower cities in New Jersey to force out-of-state banks to appoint a local entity to care for the properties. “By holding creditors’ feet to the fire in terms of maintaining these properties, we can avoid some of the blight which is infecting our communities,” Rice said. Cities with large minority populations, including the three in New Jersey that are near the top of the foreclosure rankings, face an especially difficult challenge. A report last month by the National Fair Housing Alliance (NFHA) found that banks poured many more resources into maintaining bank-owned, or “real-estate owned” (REO), properties in largely white neighborhoods than in African-American and Latino areas. 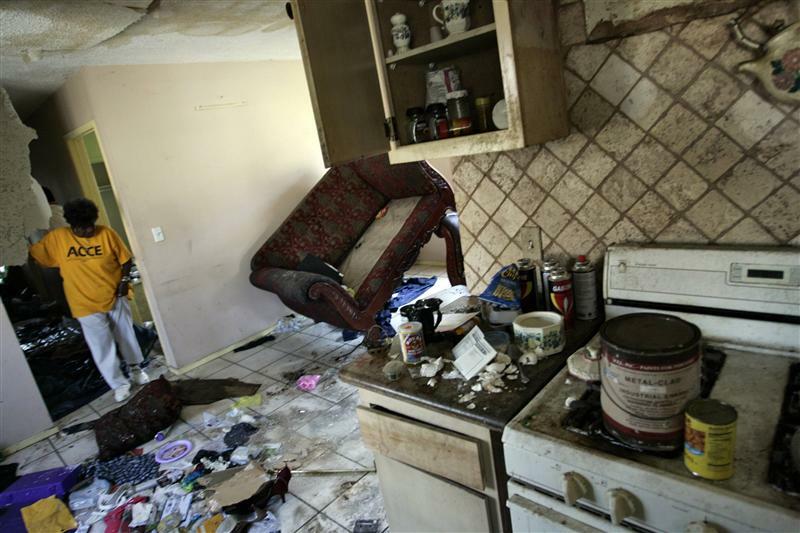 The organization examined more than 1,000 properties in nine U.S. cities. It found that properties in minority neighborhoods were 42 per cent more likely to have poor or no maintenance than those in majority white areas. In April, the NFHA filed a federal housing discrimination complaint against Wells Fargo. It accused the bank of systematically allowing foreclosed properties in minority neighborhoods to fall into disrepair, and failing to market them. In Florida, one of the states hardest hit by the U.S. foreclosure epidemic, banks have received thousands of citations for health and safety code violations in properties they own. In 10 cities in south Florida, 10,300 such code violations have been levied against banks since 2007, according to a recent investigation by the South Florida Sun-Sentinal. But even where cities fine banks, and then place liens on properties aimed at forcing the banks into action, little maintenance is done. “The fines and the liens are worthless,” said Suzanne Boisvenue, a city commissioner for Oakland Park, Florida. In most cases, Boisvenue said, banks simply ignore liens placed on blighted homes they own. In the meantime, she said, cities are forced to pay contractors to mow unkempt lawns, drain fetid swimming pools and board up broken windows. Then, when the bank finally comes to sell the properties, they bargain down the liens. Cities are desperate to see owners in the homes and thus are more than willing to cut deals. Liens worth in excess of $100,000 are routinely reduced to as little as $2,000, Boisvenue told Reuters. In San Francisco most banks that own foreclosed homes are not local, said a staffer to Malia Cohen, a member of San Francisco’s Board of Supervisors whose district in the city’s southeast has seen a wave of foreclosures. Banks that own foreclosed homes are responsible for paying property taxes on the dwellings. Banks say they continue to pay those taxes, and no activist groups or other critics contend that they do not. Some cities say they are having greater success in forcing banks to take action. Patrick Ravenstein, a code enforcement official in Phoenix, Arizona, said he had more than 50 inspectors who conduct about 16,000 inspections a month to levy and enforce fines on blighted, bank-owned properties. He said if banks fail to respond, they are taken to court. Either way, Ravenstein said, about 90 percent of such properties have ended up repaired and maintained. “We have had significant cooperation from the banks,” he said. Back in Los Angeles, Zamperini stood outside 11211 South New Hampshire Avenue, a property foreclosed on in May 2010 and now owned by San Diego-based Guild Mortgage Co. It is a shocking sight. Inside, where squatters had recently lived, the floors are covered with broken glass, used condoms, cigarette butts, toilet paper and filthy clothes. Names and numbers of local prostitutes are scrawled on the walls. Guild Mortgage did not respond to repeated requests to comment on the filthy state of 11211 South New Hampshire Avenue. “If you were a bank, and you got a $100,000 fine on a property like this, what would you do? You’d just walk away,” Zamperini said.